Mobility in the enterprise has taken off and it’s headed in only one direction. I’ve read the hand-wringing in the press about the lagging adoption of enterprise mobility. I suppose that it makes for provocative headlines. But that’s not what we are experiencing in our business as an enterprise mobility solutions provider. We see professional services organizations moving forward with requirements, timelines, and budget. They can’t wait any longer. The business demands it. For years the concern has been that enterprise mobility had not moved beyond Email, Contacts, and Calendar. Fortunately, a couple of leading enterprise software companies have shared their real-world data and colorful charts. Let’s take a look at the data. 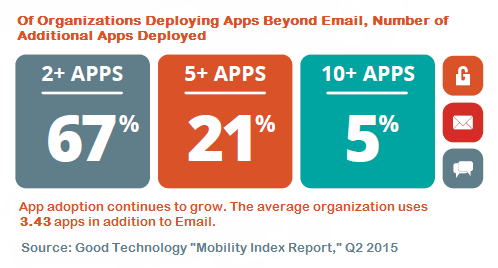 Good Technology’s “Mobility Index Report” for Q2 2015 shows that their typical customer has deployed 3.43 apps in addition to Email. 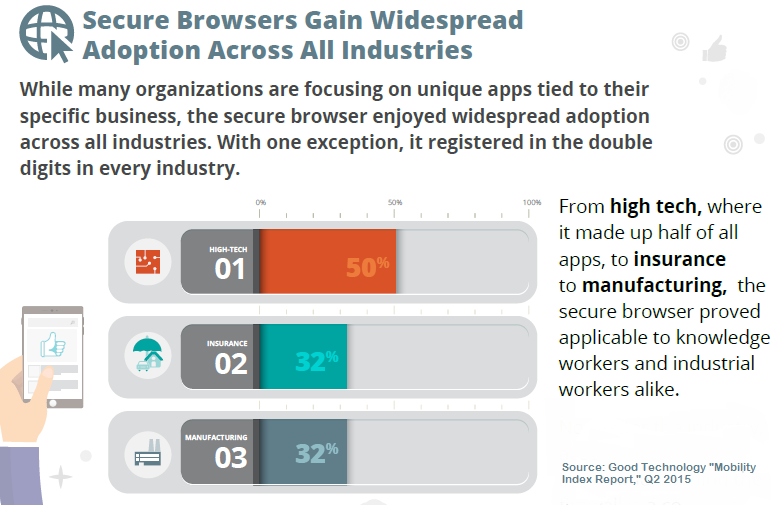 The Secure Browser is the leading application (after Email) with strong adoption in high tech, insurance, and manufacturing. Okta, the rapidly growing cloud-based identity management company, has a rare view of enterprise applications because they have data on logins to cloud and mobile apps. They looked at 2,500 customers over 4,000 apps and millions of daily logins. Okta published the key findings in “Okta’s Businesses @ Work Report” for 2015. The chart below shows the percent of users logging in from mobile devices across industries over the preceding 30 days. Education leads the way with over 35% of logins from mobile devices. Retail is second at near 28%. 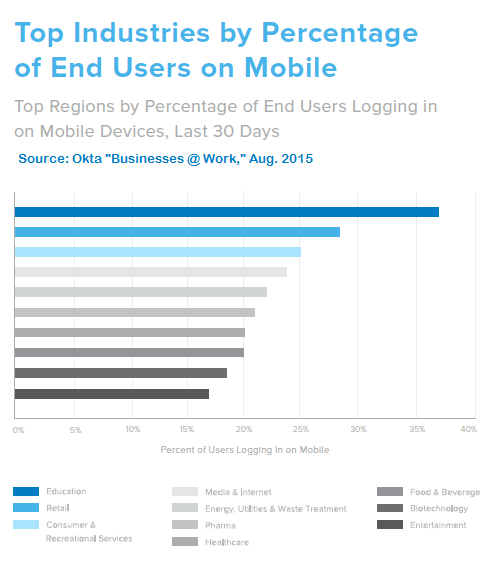 Six more verticals are at or over 20% of logins from mobile devices. These figures show mobile usage which is well beyond the early adopter stage. They indicate significant adoption. In 2015 it is common for a client to engage us to enable specific workflows from smartphones and tablets. Executives are out of the office. They need refer to financial data or to approve an invoice wherever they are. Professional staff wants to review a doc, check a shared calendar, or look up billing history. There is simply no reason to let these tasks pile up throughout the day. The business risk is poor responsiveness to clients. The personal toll is having to catch up in the evening at home. Mobile solutions for these workflows exist today which are easy to use and can be deployed in a day. In our deployments, our secure browser is also a key application, especially for access to the firm intranet portal. Our clients are in document-centric professions, therefore, management, search, edit, email, and filing of documents typically comprise the top mobile workflows which we enable for our customers. However, access to numerous browser-based applications ranging from billing to network management round out the productivity picture. Are you working while mobile? 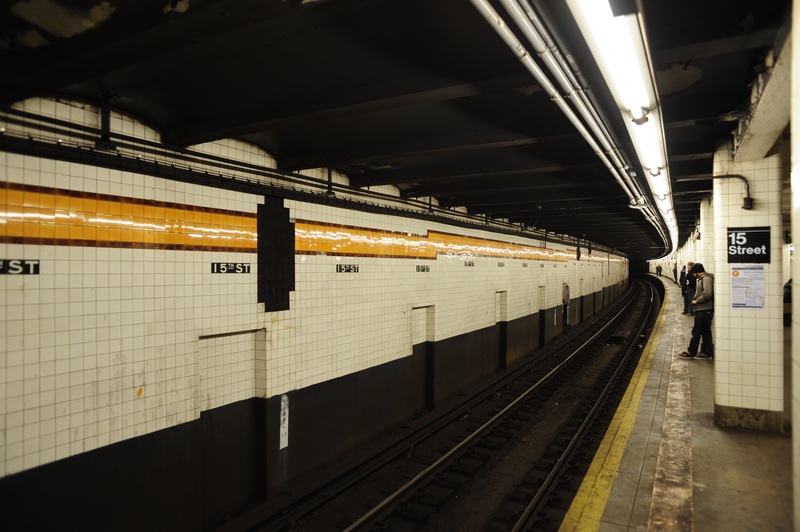 What can you get done while commuting to your next meeting? This entry was posted in HelixPulse Blog, Mobile Productivity, Mobile Security and tagged enterprise mobility, mobile apps, secure browser, smartphone, Tablet by Maureen. Bookmark the permalink.